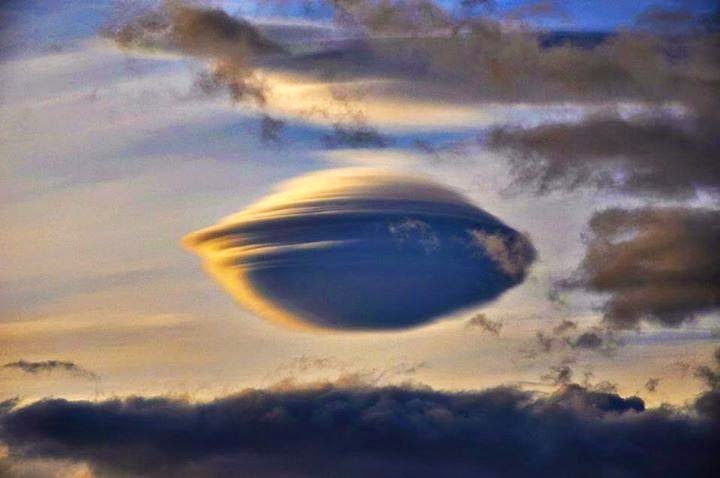 More of a general interest offering, inspired by the amazing photograph to your left (found via Climatologia Geográfica) than anything particularly HandPan related - but as far as we're concerned, a giant HandPan shaped cloud floating in the sky, is certainly deserving of a short post here. This gigantic HandPan in the sky is a particularly stunning example of a 'Lenticular Cloud' (or 'altocumulus lenticularis' to use their scientific name), stationary cloud structures that form in the troposphere. The Technical Stuff (from Wikipedia): As air flows along the surface of the Earth, it encounters obstructions. These are man-made objects, such as buildings and bridges, and natural features, like hills, valleys, and mountains. All of them disrupt the flow of air into eddies. The strength of the eddies depends on the size of the object and the speed of the wind. It results in turbulence classified as ‘mechanical’ because it is formed through the “mechanical disruption of the ambient wind flow. Where stable moist air flows over a mountain or a range of mountains, a series of large-scale standing waves may form on the downwind side. If the temperature at the crest of the wave drops to the dew point, moisture in the air may condense to form lenticular clouds. As the moist air moves back down into the trough of the wave, the cloud may evaporate back into vapor. Under certain conditions, long strings of lenticular clouds can form near the crest of each successive wave, creating a formation known as a "wave cloud." The wave systems cause large vertical air movement, enough that water vapor may condense to produce precipitation. The clouds have been mistaken for UFOs (or "visual cover" for UFOs), particularly the round "flying saucer"-type, because these clouds have a characteristic lens appearance and smooth saucer-like shape; also, because lenticular clouds generally do not form over low-lying or flat terrain, many people have never seen one and are not aware clouds with that shape can exist. Bright colors (called irisation) are sometimes seen along the edge of lenticular clouds. These clouds have also been known to form in cases where a mountain does not exist, but rather as the result of shear winds created by a front.